Our anniversary is coming up (actually it was on March 16th) and we are celebrating with friends and family in California. It took me a year to settle on the idea of having a party and it took also a lot of negotiations about what to do and mainly how many people to invite. I simply don’t need big crowds to celebrate my connection with Rajendra and beside that, big crowds make me extremely nervous when I am in the centre of attention! We will only do a tiny little celebration in the middle of a redwood grove in the Oakland Hills. BBQ and cakes from my mother and my sister friend Anja, a pomegranate juice, prosecco with blueberries in the beginning and a little surprise. 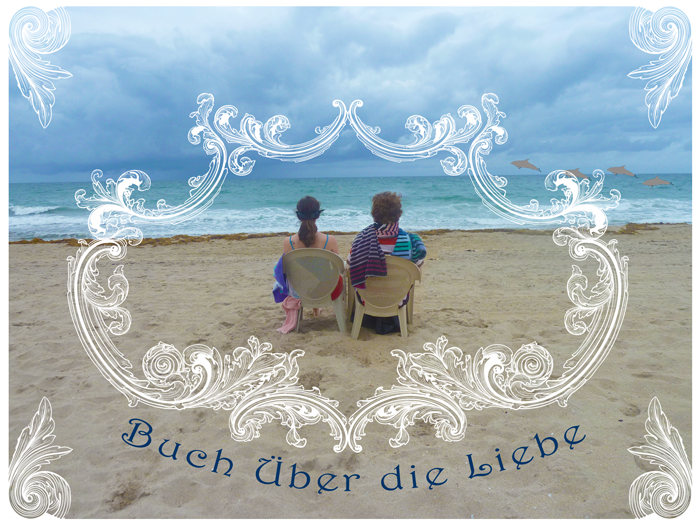 Everyone is asked to add a page to our Buch Über die Liebe (Love Celebration Book). 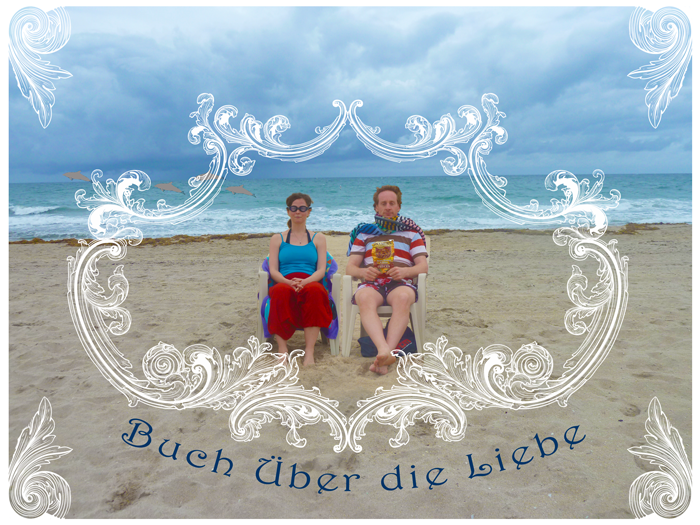 It can be a poem, an illustration, a photo or anything else people are inspired to create when they think of us or the celebration of being together or being on the ocean with dolphins. Does “planning to be there” mean you will be there 🙂 ?? Great that you come or plan to! You are savvy to ask. My being there: 82.5% likely. Exceptions would be if I decided to go out of town that weekend, which is unlikely. But I don’t plan very far ahead, so it could happen. Rajendra said I could bring a date. I hope that’s ok. At the moment, I say there is a 73% chance I would bring a date. But here we are dealing with the whim of a woman, and calculations are complex. Are you comfortable with these numbers? very comfortable Mr. J and curious about the whim of a woman too! But still 15% to go…! Well, I slipped a little somethin-somethin into her mimosa this weekend and now apparently she puts our odds at 99.5% that we will be in attendance this Sunday. I think this is the best rsvp conversation I ever had! This entry was tagged Anniversary, Wedding. Bookmark the permalink. solid answers’ is the USA pendant to the ‘berliner Verabredung’ [berlinly apointment] in D.
PS Wenn Du den Dialog etwas umschreibst, kann man ihn im Oberstufenmatheunterricht als Textaufgabe für Wahrscheinlichkeitsrechnung (mehrstufige Zufallsexperimente) oder und Entscheidungsbäume nehmen …. Ha! Im Oberstufenmathematikunterricht! Darauf wäre ich ja nie gekommen 🙂 Wenn Du magst kannst Du ja mal den Schulinspektor darauf aufmerksam machen. Ich wußte gar nicht, daß die Berliner auch so unverbindlich sind. Vielleicht leben deshalb viele Künstler aus San Francisco teilweise in Berlin…ist ja fast wie Zuhause.